Wait! Who are we marketing too again? At any given time in history the traditional role of marketing created content to support strategy only when necessary as it suited the company’s needs – a promotion, product launch, sales brochure or direct mail piece. Times have changes and the ability to develop targeted content specifically geared towards your customers’ needs is critical to the success or failure of your brand. Yes we’ve all heard the “content is king” but today it’s not just king but the entire kingdom. And, it’s not just about creating content for the sake of content, understanding who you’re developing content for is paramount in the process and, with the majority businesses today, it’s not just one individual, it’s several potential buyers. Content marketing around the globe is gaining traction as well. But it’s not more content that we’re after. We already have more than enough. We are all bothered by information overflow or interruption marketing. What prospects and customers search for is content that helps them with their problems and helps them make good (intelligent) buying decisions…something they do everyday. As marketers we use content to connect with these potential buyers, during their buying process and afterwards. We use content to cement relationships that not only speaks directly to buyers, but also gets them speaking back to us in discussion. And we use content to distinguish ourselves as an expert and trusted provider. Again, it’s not just sufficient with any content. It’s only the meaningful compelling content that our target customers are interested in. Everything else just adds to the interruption marketing that we’ve become good at filtering out. A CMO from a Fortune 500 companies states: “When we have deep information about our customers, it makes all the difference in the world,” Hundreds, if not thousands of CMO’s across the globe make similar comments. Understanding exactly how buyers are behaving and thinking is becoming more of a premium for achieving success in marketing today and developing relevant compelling content that help they solve problems can make the difference between getting your marketing strategy right – or not. OK, I would argue that “relevant content creation is now king” and the brick and mortar foundation of the kingdom is inbound marketing. Why? Inbound marketing forces you to give up that traditional approach to content creation. But constantly coming up with new content can be overwhelming, and if you panic and start pushing out content that’s a bad fit for your audience, you risk attracting the wrong kind of visitor while driving away high-quality prospects. Today’s CMO’s must have a detailed picture of their target audience in order to create optimal content for them. One of the best ways to understand your audience is to build buyer personas. There’s been a lot written about how to build buyer personas but typically it boils down to with these 3 steps: segment by demographics, identify their needs, and develop behavior-based profiles. Who are your ideal customers and prospects? What are their biggest concerns, needs, and interests? Where do they browse search, read, online and can you reach them – on search engines, social media, blogs – and what kinds of content do they prefer? 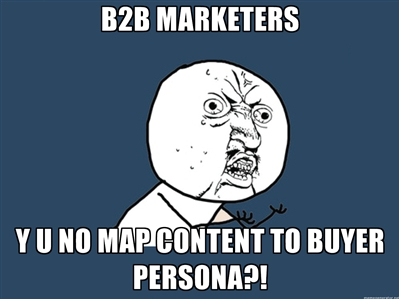 These types of questions will help you develop buyer personas. NOTE: Personas are fictional representations of your ideal customers, based on real data about customer demographics and online behavior, along with educated speculation about their personal histories, motivations, and concerns. One of the best ways to start developing buyer personas is by researching your existing customer base to identify the most common buyers for your products and services. You may have several different types of buyers, so give each one a detailed description, including name, job title or role, industry or company info, and demographic info. For example, a large retail chain’s biggest customers may include small business owners and mothers managing for a family of four. In this case, the chains marketers might name these personas “Business Owner Bill” and “Susan, the Busy Mom,” and extrapolate details about their responsibilities, the typical size of their business or household income, what geographic region they’re in, and so on. What do they need most in a retail chain? What information are they typically searching for when they are online? Understand and analyze that prospects take on the journey to becoming a customer is a great way to get insights about the needs and challenges of your target audience. If you use a marketing platform like HubSpot, you can see which search terms brought prospects to your site, how long they stayed on your site, which pieces of content they viewed, and which forms they’ve filled out. Such lead information will help you make better decisions when identifying the characteristics of your ideal customers and ways to nurture your new prospects. Which of your products do they spend the most time researching? How do they use those products? The result of this process should be a detailed description of your personas’ demographics, needs, and behavior. The more detail you pack into your persona development, the easier it will be to build and manage a successful content strategy for each of your target customer segments and know where to promote it. In the end remember, relevant content is king and understanding your audience is absolutely critical and fundamental for all successful content marketing.